Child care in the United States is both unaffordable and hard to find.1 Seventy-one percent of parents report that locating quality, affordable child care in their communities is a serious problem.2 Moreover, a recent survey found that the cost of child care is the top reason that adults in the United States are having fewer children.3 It is little wonder that the movement for child care reform is growing. 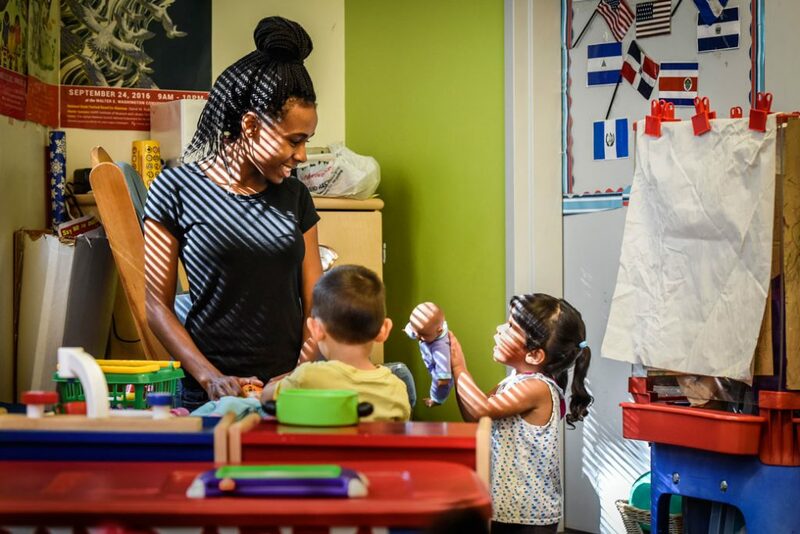 Congress included the largest-ever funding increase for the nation’s child care assistance program—the Child Care and Development Block Grant—in the fiscal year 2018–2019 budget, which serves as a down payment on the CCWFA.8 While this funding increase represents a critical first step that will lead to real improvements for families, a more comprehensive solution is needed to help all families afford and access quality child care. Three in 4 children ages 12 and under would be income-eligible for child care assistance. The median family’s child care payment would not exceed $45 per week. All child care workers would earn a living wage. Three-quarters of child care workers currently earn below a living wage and would therefore see a pay increase. A typical married couple, let’s call them James and Michelle, live with their 1-year-old daughter and 4-year-old son in Grand Rapids, Michigan. James works as a mechanic and Michelle as a home health aide, bringing home a combined income of about $81,000 each year. About a quarter of their income currently goes toward paying for child care for their two children, and after paying for their mortgage, car payment, health insurance, and groceries, James and Michelle barely make ends meet each month. Michelle has considered leaving her job to stay home with her children instead of spending half of her salary on child care but worries about losing her income and falling behind in her career. The CCWFA, if passed, would help families with children ages 12 and under afford high-quality, flexible child care, as well as after-school and summer care. Under the CCWFA, families earning up to 150 percent of their respective state median income (SMI) would be eligible for assistance and would spend no more than 7 percent of their income on child care, no matter how many children they have. 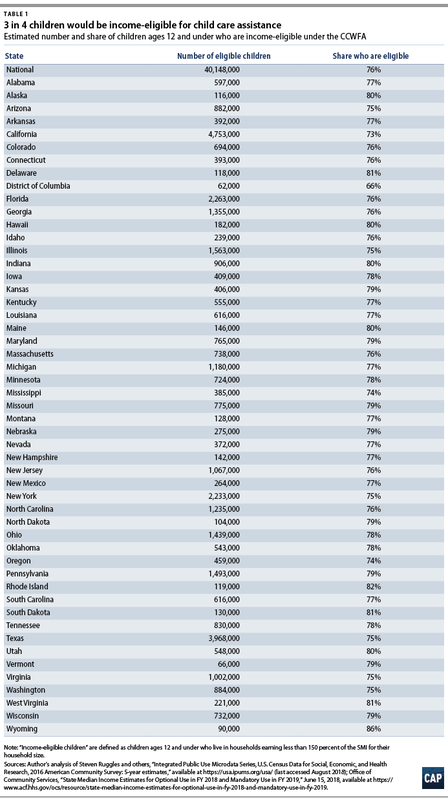 As proposed, the bill operates on a sliding scale, meaning that lower-earning families would pay a smaller percentage of their income toward child care. 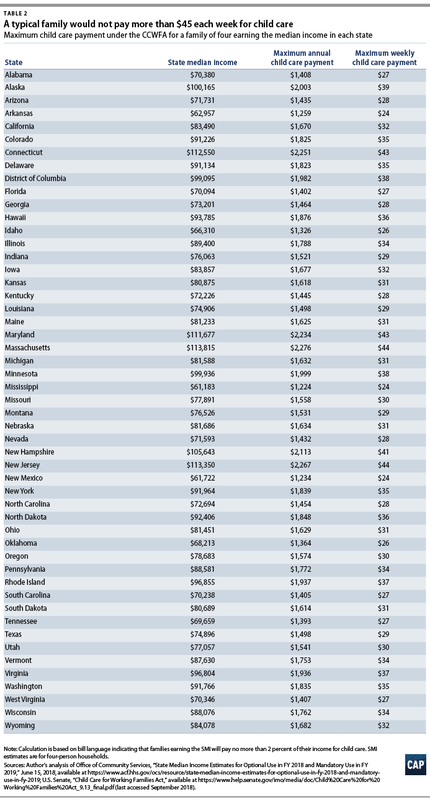 (see Appendix table) For example, an Ohio family of four earning $81,400—the median income for the state—would be expected to pay a maximum of $1,600 per year for child care. An Ohio family earning about $61,000 or less per year would have no copay obligation; in other words, they would pay nothing for their child care. Guarantee child care assistance to low-income and middle-class families earning up to 150 percent of the SMI. Ensure that early childhood educators earn a living wage and are compensated at the same level as elementary school teachers if they have the same credentials and experience. Provide funding and incentives for states to expand high-quality preschool programs to serve 3- and 4-year-olds. The CCWFA would create an estimated 2.3 million jobs. Under the CCWFA, the median family of four in every state would spend no more than $45 each week on child care, no matter how many children they have. 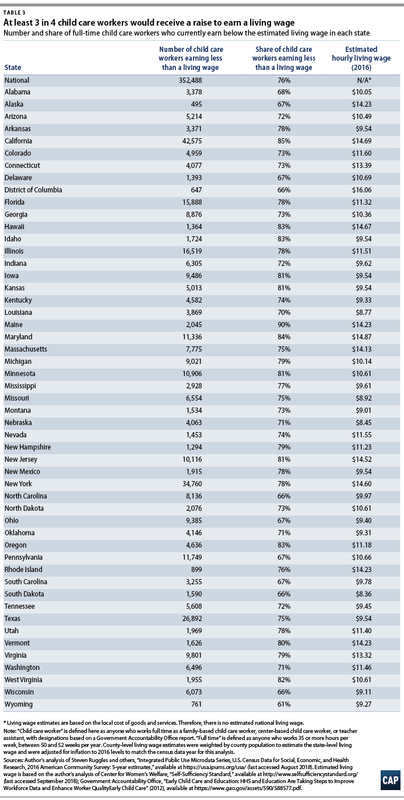 (see Table 2) Maximum payment rates for the median family of four would range from $23 per week in Mississippi to $43 per week in Massachusetts. Under the CCWFA, the median family of four in every state would spend no more than $45 each week on child care, no matter how many children they have. The CCWFA would promote a more equitable child care system and give parents greater freedom to select a child care program based on factors other than cost—such as quality, curriculum, location, or operating hours. At the same time, the bill invests in building the supply of quality child care programs by incentivizing quality improvements. Ultimately, the CCWFA will give all parents the ability to choose from a broader set of high-quality child care options, no matter their income. The care and education of young children requires knowledge, experience, patience, and energy. Offering more competitive wages gives greater recognition to the level of skill necessary to be an effective early educator, which in turn will help to attract and retain high-quality educators who may otherwise leave for higher pay teaching preschool or elementary school.31 Retaining qualified and experienced early educators will ultimately enhance the quality of service that children in child care receive. The reality is, America’s child care system is not going to fix itself. Each day that Congress waits to pass comprehensive child care reform embodied in the CCWFA, American families will continue to struggle to pay for child care; early educators won’t earn enough to make ends meet; and businesses will continue to lose productive employees. The recent investment in the Child Care and Development Block Grant was a critical first step toward addressing this problem; now, the momentum toward a more comprehensive solution must be sustained. The CCWFA is smart policy that is well worth the federal investment. American children, families, workers, and the economy cannot afford to wait another year to enact this innovative and necessary legislation. Tier 1: Families earning less than or equal to 75 percent of the SMI will not pay a copayment. Tier 2: Families earning between 75 percent and 100 percent of the SMI will pay at least a nominal fee and a maximum of 2 percent of their income. Tier 3: Families earning between 100 percent and 125 percent of the SMI will pay between 2 percent and 4 percent of their income. Tier 4: Families earning between 125 percent and 150 percent of the SMI will pay between 4 percent and 7 percent of their income. To view the Appendix table, download the PDF.